This 208-page book accompanied the exhibition of the same name and was published in conjunction with the 50th anniversary of the passage of New York’s pioneering Landmarks Law, enacted in April 1965. That law was a key factor in the rebirth of New York in the final quarter of the 20th century. It fostered pride in neighborhoods and resulted in neighborhood preservation in every borough, connecting and motivating residents and bringing new economic life to older communities. It ensured that huge swaths of the city remain a rich complex of new and old. It also ensured the creative re-use of countless buildings. At the same time, a new body of important architecture has emerged as architects, clients, and the Landmarks Preservation Commission devised innovative solutions for the renovation of landmark buildings and for new buildings in historic districts. The law spawned creativity in architects’ responses to building preservation that has enhanced the cityscape in all five boroughs. 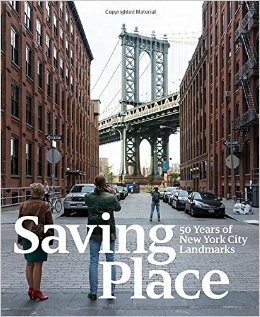 The book featured specially commissioned photographs of city landmarks by Iwan Baan.